They say that two things are certain: death and taxes. But another certainty is that once you've built your business around a particular tax structure, it will change. Since the new tax plan was officially announced three months ago, companies that operate in or with the United States are still scrambling to understand it, especially along with new trade restrictions, import regulations, and tariffs. Some changes, such as the import restrictions on solar panels and washing machines, have been released in full, but others remain mere speculation, making import compliance all the more difficult this year. Among all these changes, the tax plan has already started changing global trade management operations. The new lower corporate tax rate of 21% has left many CFOs smiling and others rushing to figure out how to take advantage. Some companies, excited by the change, have decided to relocate their manufacturing centers - bringing them to the US and investing more in domestic factories and equipment. This includes Kimberly-Clark Corp., maker of products like Kleenex tissues and Scott's paper towels, which is "spending hundreds of millions of dollars to put new machinery in one of its US factories, even as it closes others and cuts thousands of jobs,” and Amicus Therapeutics Inc., which has "decided to spend as much as $200 million on a new production facility in the US instead of Europe,” according to The Wall Street Journal. In fact, Amicus claims that, like many companies, it wished to establish its core facilities in the US, but the lower corporate tax rate in Ireland, where they currently manufacture, made more financial sense. Ireland's corporate tax rate is 12.5%, a relatively low rate that has attracted many American companies like Amicus that wished to avoid the 35% US corporate tax, The Wall Street Journal reports. Other companies, like United Natural Foods, had struggled with their supply chain agility and were unable to meet the demand for their products. Last year, they lost $25 million in potential sales due to out of stock items, Business Insider reports. If they decide to begin manufacturing within the US it means they won’t have to import their goods into the country and leaves room for potential expansion to meet those demands. Ultimately, the reduction in taxes is intended to leave companies with more money to spend and re-invest into the company and thus the American economy. In addition to the tax plan, new restrictions on solar panels and washing machines have been put in place. The idea is that these restrictions will invigorate American businesses in an over-saturated market and give them a more level playing field against international conglomerates. POLITICO notes, "the US International Trade Commission has already determined that increased imports are ‘a substantial cause of serious injury to the domestic industry.’ That gives Trump the legal basis to impose temporary import restrictions to help the affected companies recover.” This is great news for American manufacturers of solar panels and washing machines, but terrible for the mainly Chinese manufacturers who dominate in the US market. Not every change has US companies jumping for joy. In case you missed our webinar, Your Shipment Was Stopped? Don't Get Blindsided by Customs Laws & Regulations!, new tariffs on steel and aluminum are in progress. Unlike the regulations on solar panels and washing machines, which only really affect those industries, these raw material tariffs will impact shippers across many industries and verticals. The tariffs on steel and aluminum have been imposed under Section 232 of the Trade Expansion Act of 1962, which allows the president to levy tariffs on imports due to a threat to national security. The tariff rate on steel imports has been set to 25% and aluminum now has a 10% tariff. Among the fallout of released regulatory changes, many anticipate additional tariffs specifically targeting Chinese companies, as the US trades with China more than any other country in the world. In 2016 alone, the US imported over $462 billion worth of goods just from China and only exported $115.6 billion worth of goods to China. This left the US with a trade deficit of $347 billion. Sourcing Journal reported earlier this month that the current US administration was looking to apply tariffs on as much as $30 billion worth of Chinese imports using Section 301 of the US Trade Act of 1974. According to Sourcing Journal, “a Section 301 investigation would allow the president to impose the tariffs without approval from Congress if it’s deemed that China’s intellectual property impropriety has burdened or restricted US commerce.” We now know that the president has in fact begun the process to impose tariffs on $60 billion worth of Chinese imports, double the initial estimates. Keeping that in mind, while many of these changes appear to incentivize companies to move manufacturing facilities and jobs to the US, and may expand the domestic demand for US manufactured goods, they do not exist in a vacuum. The fear of retaliation from other nations in the form of tariffs levied against the US is a real concern. If other countries do retaliate and levy higher tariffs, many US businesses will have to adapt by potentially changing core business practices. Thankfully, we’re not quite there yet. No matter what changes may come, Amber Road is here to assist you. 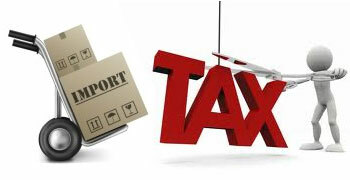 Amber Road’s import management solutions can accurately track, manage and report on all import duties and taxes for you - easing the burden of keeping track of all the country-specific trade regulations. From training and consulting services to the comprehensive supply chain solutions we’re known for, Amber Road has something for almost every situation. Discover how Amber Road can help you today by exploring our solutions.